Any time a microphone is used outdoors it has the potential to pick up wind noise. Unlike sound sources which are pressure waves, wind noise is surface wave. Microphones pick up this bursty and turbulent airflow over the microphone. The resulting wind noise is often much louder than the desired speech signal and significantly reduces the speech quality and intelligibility. There are two main ways to reduce the effect of wind noise: acoustically and algorithmically. In acoustic wind noise reduction, the mechanical design of microphone enclosure is engineered to reduce the amount of turbulent airflow over the microphone, while letting the desired signal through unimpeded. Unfortunately, these designs often do not completely eliminate the noise or are not practical for the product design. Thus, many different algorithms have been developed to suppress the wind noise and improve the quality of the microphone signal. 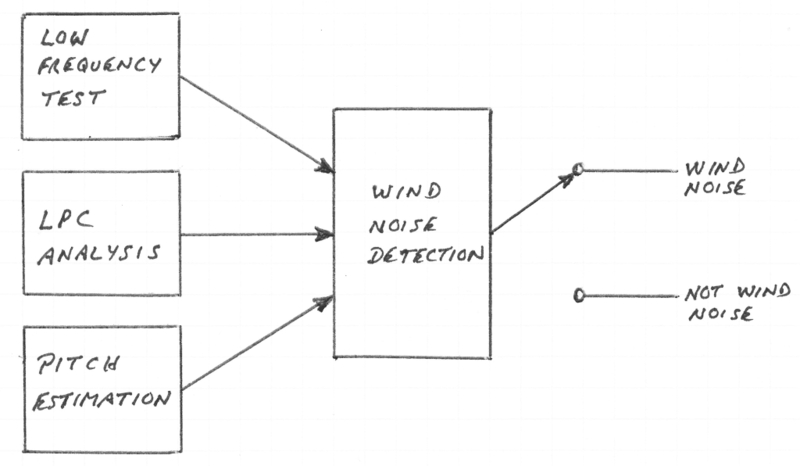 The key component to any wind noise reduction algorithm is the ability to detect when wind is present in the signal. If the ratio of the power spectrum of the lower frequencies over the total power spectrum for all frequencies is greater than a defined threshold, then the signal is likely wind noise. Although this is a simple test that rarely results in missed detects of wind noise, it has a tendency to produce false positives when the speech signal is voiced with harmonics that are concentrated in the lower frequencies. If the sum of the absolute difference between LPC coefficients of different orders is less than a defined a threshold, then the signal could be wind noise. It turns out that this test is very reliable for detecting the presence of the speech, but does properly differentiate between wind noise, unvoiced speech or regular background noise. Pitch estimation can also be used to distinguish voiced speech signals which are quasi-stationary while wind noise is non-stationary. Therefore, the variance of a pitch estimate would be large for wind noise and small for speech signals. Similar to the LPC test, this is good for detecting the presence of voiced speech rather than wind noise itself. Wind noise has many signal characteristics that are different than speech. However, using a single metric for the detection of wind noise will not produce accurate results. Thus, a combination of the several metrics can produce reliable detection.